1. The Capricorn sign Birthstones: The Onyx and the Garnet: The Capricorn soul needs rules and structure in order to feel content. The Onyx is the stone that can provide that structure and authority. This stone can assist the Capricorn individual with manifesting his destiny and can help him build the confidence needed to achieve that goal. 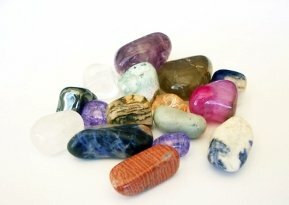 Its a great stone for grounding at times of uncertainty. The Garnet, on the other hand, a livelier and lighter stone, can bring a little serenity and peace to the Capricorn soul. Sometimes a bit on the serious side, a Capricorn at times needs to be released of his duties  a service that the Garnet is happy to provide. It is a revitalizing stone that can bring serenity or passion as needed. 2. The Onyx, Amber, Ruby, and Azurite Potential: The Capricorn sign is known for its organizational ability and desire for useful service. Many Capricorns have a secret wish to reach the top of the corporate ladder and have the discipline to do so. The Onyx is the stone needed to support the Capricorn drive while Amber is the stone that can help link that drive with the vitality it needs to thrive (the Ruby's specialty)  promoting exemplary leadership. Only after the desired status is reached, will the Capricorn individual explore the more spiritual realms of life. For this purpose, it is the Azurite that would prove to be most useful. It can help the Capricorn soul unleash his intuition and connect to his inner wisdom. 3. The Capricorn Soul Pathway Stone  The Black Obsidian: The Black Obsidian stone has a very powerful energy that probably only the Capricorn individual can handle. Its dark shadows reflecting glimpses of light if turned in the right way, reflect a Capricorns own inner strength and abundance. The Capricorn souls path is that of inner authority and power, desiring to live from the inner self. The Black Obsidian can provide the support needed for this journey.